The role of the physical–chemical properties of intracellular membranous structures such as membrane fluidity in AD pathogenesis has been extensively studied. Membrane fluidity is a complex parameter, influenced both through some biophysical (temperature, electrical charges, pH) and biochemical factors (protein/phospholipids ratio, phospholipids/cholesterol ratio, degree of fatty acids unsaturation). It is a parameter that reflects the main membrane characteristic organization (gel or liquid crystal structure). Experiments provide consistent data about membrane fluidity relations to various cellular processes, especially membrane processes. Changes in the membrane composition and structure could alter the conformation and function of transmembranal ion channels, as well as affect the interaction of receptors and effectors, leading to altered signal transduction, handling of Ca”, and response to exogenous stimuli . Cholesterol distribution within the plasma membrane is not homogeneous: the highest level of free cholesterol inside the plasma membrane is found in cytofacial bilayer leaflet . The exofacial leaflet contains substantially less cholesterol, and it is mostly condensed in lipid rafts, which are more tightly packed than nonlipid raft domains due to intermolecular hydrogen bonding involving sphingolipid and cholesterol . This asymmetric distribution of cholesterol is altered by aging: it is significantly increased in exofacial leaflet with increasing age [76,77]. It has been reported that membrane fluidity of lipid membranes in the brain cortex of AD samples were significantly thinner (that is, had less microviscosity) than corresponding age-matched controls. This change in membrane width correlated with a 30% decrease in the ratio cholesterol/ phospholipid . In our group of research we assessed the membrane fluidity in platelet submitochondrial particles and erythrocyte membranes from Mexican patients with Alzheimer disease. Submitochondrial particles are mainly constituted of inner mitochondrial membrane and are the site of oxidative phosphorylation and other enzymatic systems involved in the transport and utilization of metabolites. Membrane fluidity was estimated measuring the intramolecular excimer formation of the fluorescent probe 1,3 dipyrenylpropane incorporated in membranes. Similarly to the data reported from mitochondria in AD brains fluidity ., a reduced fluidity in the platelet inner mitochondrial membrane was found. It can partially be due to increased levels of lipid peroxidation . Reduced membrane fluidity can diminish the activities of the enzymes of oxidative phosphorylation and other transport and receptor proteins, in as much as these enzymes are regulated by the physicochemical state of the lipid environment of the membrane. It may diminish significantly the ATP generation from the mitochondria. 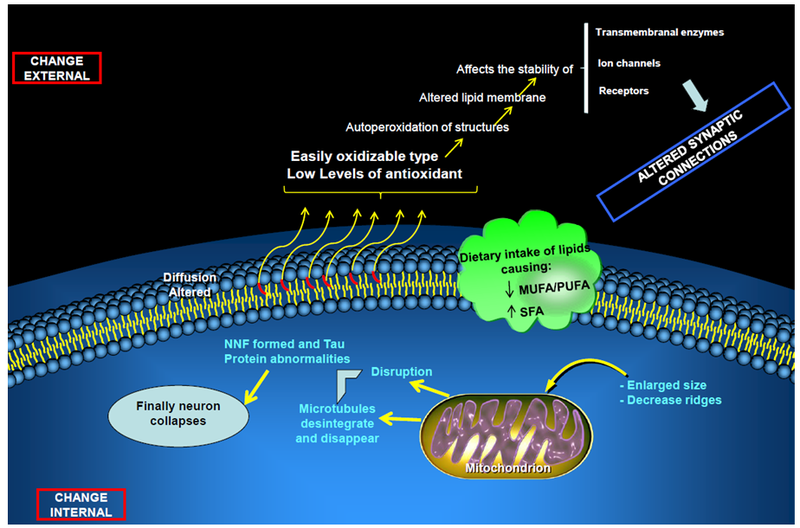 Interestingly, dysfunctional mitochondria and oxidative damage has been involved in Alzheimer’s disease . In agreement with previous reports, membrane fluidity from erythrocyte was not altered in AD , regardless of increased lipid oxidation in erythrocyte AD patients. This suggests that, in AD, mitochondrial membranes are more sensitive to oxidative stress than erythrocytes. In contrast to platelet inner mitochondrial membrane, it has been reported an increase in fluidity in whole membranes from platelets of AD patients . This increase results from the elaboration of an internal membrane compartment resembling endoplasmic reticulum that is functionally abnormal . At this regard, it is worth noting that the contribution of mitochondrial membranes to the whole cell membranes in platelets could be minimized since platelets contain few mitochondria . Some strategies for the preservation of membrane fluidity include the use of polyunsaturated fatty acid (PUFAs). The brain is particularly rich in PUFAs such as eicosapentaenoic (EPA) and docosahexaenoic acids (DHA). PUFAs play an essential role in the normal development and functioning of brain . Diets enriched in n-3 PUFA increased membrane ﬂuidity, affect signal transduction and modulate gene expression for brain function . Furthermore, DHA have the following effects: maintains membrane ﬂuidity, improved synaptic and neurotransmitter functioning, enhanced learning and memory performances and displayed neuroprotective properties , decreased the amount of vascular Aβ deposition  and reduced Aβ burden . In AD mouse model, DHA modulated APP processing by decreasing both α- and β-APP C-terminal fragment products and full-length APP . However, caution should be taken when PUFAs are used for dietary supplementation, since DHA could be increasing oxidative stress, resulting in lipid peroxidation [95,96]. Addition of cholesterol restored the membrane width to that of the age-matched control samples. Alterations in other membrane components of AD brains have also been reported. The cholesterol content in lipid rafts has been shown to contribute to the integrity of the raft structure and the functions of the rafts in signaling and membrane trafficking . At this regard, it has been shown that cholesterol depletion leads to increased membrane fluidity  mainly in intracellular membranes  and reduced endocytosis, shifting sAPP shedding from β-cleavage towards α-cleavage . In fact, the cleavage of APP by β-secretase , occurs mainly in highly ordered membrane microdomains dispersed at the cell surface. These microdomains known as lipid rafts are enriched in cholesterol, sphingolipids and saturated phospholipids. Lipid rafts appear to be a mechanism to compartmentalize various processes on the cell surface by bringing together various receptor-mediated and signal transduction processes. The cleavage of APP by α-secretase is done mostly in nonraft domains . Furthermore, it has been shown in vitro that lowering cholesterol leads to decreased BACE-cleavage of APP [102,103] and increased α-cleavage of APP . Increased membrane fluidity due to cholesterol depletion inhibits endocytosis which might explain the observed increase of sAPPα and shift towards α-secretase cleavage that happens on the cell surface. Cholesterol increase is associated with enhanced membrane stiffness possibly explaining the disrupted proximity of APP and BACE. Surprisingly this is associated with enhanced sAPPβ production, possibly explained by altered transport and endocytosis mechanisms . Another explanation therefore is the direct impact of cholesterol environment upon BACE activity. In living cells, BACE seems to require intact rafts for activity, and BACE outside rafts seems to be inactive . Recent theories suggests that there would be an interaction between genetic predisposition and environmental factors that lead to cell death by amyloid toxicity or disruption of tau protein. Dietary lipids could be a determining factor in the difference in risk between developed and underdeveloped countries. 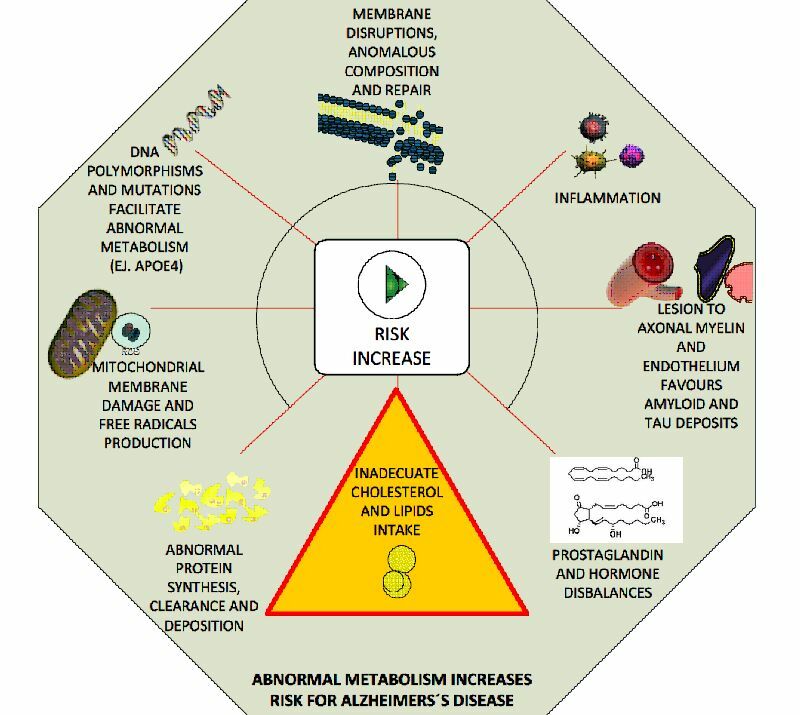 Dietary lipids could be the primary risk factor in late-onset sporadic AD (LO-SAT). The critical factors seem to be the ratios of polyunsaturated fatty acids (PUFAs) to monounsaturated (MUFA), saturated fatty acids (SFA) to essential fatty acids (EFAs). These contents are modified by the APOE4 genotype . Oxidation of neuronal lipid membranes could be the initiating event in the cascade of synergistic processes with subsequent expression of Aβ and helical filaments of hyperphosphorylated tau protein. PUFAs are important in modulating the inflammatory balance/systemic anti-inflammatory eicosanoids and fluidity and membrane function. Proinflammatory eicosanoids are derived from arachidonic acid (AA). The anti-inflammatory eicosanoids are derived from the via the n-3 EFA through DHA) and EPA. EFAs cannot be synthesized by animals and must be obtained from food. A diet rich in linoleic acid promotes proinflammatory state, while a diet rich in linolenic acid promotes inflammatory components. When lipids are exposed to free radicals begin an autoperoxidative process. This process is perpetual and changes the composition and rate of membrane lipids with loss of PUFA compared with MUFA and SFA. This causes the membrane to become less fluid and affecting the function of components, as well as of intracellular organelles and the vascular endothelium . This seems to be the initial process of the cascade that culminates in neuronal death and neuropathological sequelae associated with LO-SAT. Antioxidant vitamins and vegetables may reduce the risk of AD. High levels of blood lipids are associated with atherosclerosis and diabetes, both risk factors for EA indirect. Recently it was found that the increase in LDL cholesterol, along with APOE epsilon4 genotype is associated with increased risk of AD . The oxidative state of lipid membranes can have effects on neurons, at three levels:a) vascular;b) endothelial cell membrane; and c) membrane organelles.At the level of cellular membranes lipid oxidation accelerates the aggregation of amyloid which consequently decreases membrane fluidity. This also is observed with decreases of the content of MUFA and PUFA esterified to phospholipid. Interestingly, these changes are seen in brain regions affected in AD, especially at the hippocampus. The decrease of the membrane fluidity affects the synaptic connections . The EA may be preventable and treatable and possibly reversible to some extent, if the proposed hypothesis is correct. The changes in the fat composition of the diet are reflected in plasma lipids and phospholipids in the membrane of red blood cells, likewise in the neural cell membranes, especially in areas of rapid lipid turnover. A diet low of n-6 PUFA and MUFA, and an adequate amount of n-3 PUFA, but not too caloric, with antioxidants should protect neuronal damage, lipid oxidation and the inflammatory cascade and amyloid deposition. Lipid lowering agents appear to have a protective effect, although studies are not conclusive. Statins decrease the oxidizability of LDL, with decreased levels of oxygen reactive species, anti-inflammatory effects and improve endothelial dysfunction, also increased alpha-secretase activity. Increase the synthesis of LDL receptors, with decreased circulating level and reduced production of PPA. Cellular changes induced by lipid oxidation linked to dietary lipids. The change in dietary intake of lipids causing a low PUFA/MUFA (Polyunsaturated Fatty Acid/Monounsaturated Fatty Acids) ratio, which finally altered synaptic connections and neuron collapse . The histological changes seen in the initial stages of AD confirmed that membrane lipids and inflammation are involved in the disease (Figure 7). AGE n-3/n-6 rate has a major impact on the balance of eicosanoid metabolism inflammatory and anti-inflammatory, and the degree of saturation of membrane lipids and fluidity affects its function. The apoE4 genotype may influence the risk of AD, as it is unable to protect that transports lipids from oxidation .